Barb Sheets (left), Laura Ruzicho (center) and Ruth Deyoe are Christians. They sat front row at the HIjab Day event to learn more about the Muslim religion. Lubna Alam, the founder of the Muslim Women's Council of Southwest Florida, speaks to participants of Hijab Day before the event starts. A group of women pose in a meeting room of the Fort Myers Regional Library for the Hijab Day event hosted by the Muslim Women's Council of Southwest Florida. A group of local Muslim women are challenging the stereotypes associated with their religion a by introducing people to the hijab, or religious head scarf. 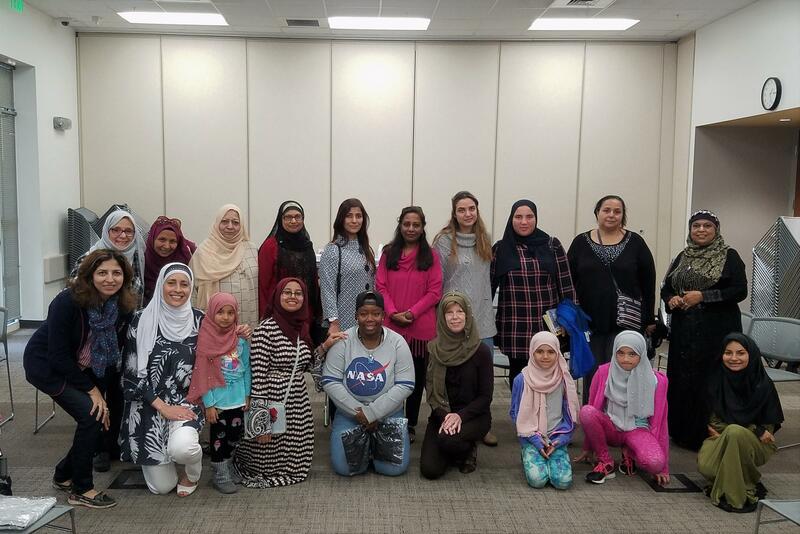 The Muslim Women’s Council of Southwest Florida invited people to learn more at the Fort Myers Regional Library in advance of World Hijab Day which is this Friday. A handful of women put out snacks and coffee and lined up chairs in one of the library's meeting rooms last Saturday. They wore eleborate hijabs, some bedazzled with rhinestones, others with edges of delicate lace. The women drove from Port Charlotte to participate in Hijab Day—a community event to demystify the Muslim religion. Lubna Alam founded the Muslim Women's Council a year ago. She moved to Southwest Florida from Wisconsin just before Hurricane Irma hit. Alam said she immediately saw a need to create a platform for Muslim women to enagage in the community. "The need to cross-collaborate is very, very great, and that is the idea of the platform. Everyone should come together irrespective of where they're from and their cultural backgrounds," Alam said. Alam says she put the Hijab Day event together to encourage people from other denominations to come and get to know Muslim women. "They think of hijab and they think of terrorism, they think of oppression they think of backwardness and I want them to break those stereotypes by talking to these women, by hearing it from them," Alam said. After a brief presentation on the religion itself, Alam opened up a Q & A session and the dozen women in attendance all moved their chairs in a circle to face one another. 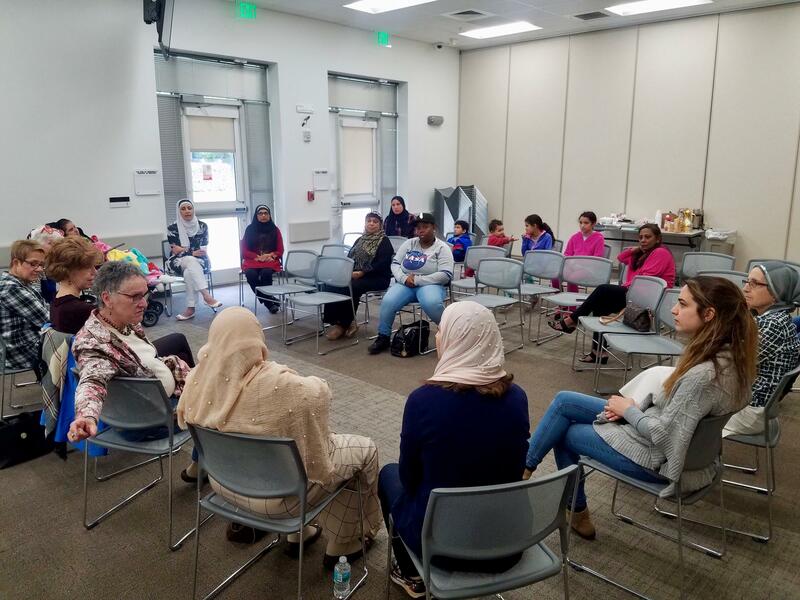 The woman who attended Hijab Day at the Fort Myers Regional Library on Jan. 26 moved their chairs to form a circle to face one another during a Q & A discussion about the Muslim faith. Samera Musallet spoke about her decision to start wearing hijab on New Year’s day thirteen years ago. "A lot of people think we’re wearing [a hijab] because we’re forced to wear it, but it’s our choice," Musallet said. "I love wearing it to show people, you know, I’m a Muslim, I’m a good person and I’m representing my religion as a woman." Yolanda Mohammed began wearing a hijab in anticipation of making a pilgramage to Mecca in 2009. She said her head scarf isn’t much different from the head coverings worn by devout women of other faiths. “It’s not just a religious thing, it’s part of a modesty thing. To cover yourselves as has been described in the bible in the torah and in the Quran," Mohammed said. Some women spoke of the hardships they face daily while wearing the hijab, others said they chose not to wear it because they feared public backlash or discrimination. One woman that works for Lee Health, said she recieved so many negative comments from her employer and the general public, that her husband feared for her safety. Ruth Deyoe, who was raised in the Christian faith and is the wife of a minister, attended the event. After hearing the hardships and discrimination some of these women faced, she addressed the group. “I have this greater respect and understanding for why you chose to wear it and now I feel more inclined to relate to you,” Deyoe said. Women were invited to put on a hijab at the end of the event. Laura Ruzicho was among the first to put one on. World Hijab Day is celebrated in 145 countries worldwide on February first. A group of women pose in a meeting room of the Fort Myers Regional Library for an event hosted by the Muslim Women's Council of Southwest Florida called Hijab Day.